Employer Responsibilities Under the F.E.L.A. The Law Offices of Patrick S. O’Brien have handled numerous death cases over the years. We can guide you through the entire process and answer any questions covering your legal rights. We have handled these types of cases in over twenty (20) states and have been successful in getting our clients compensated for wrongful deaths caused by another person’s or corporation’s negligence. A wrongful death claim is different than a personal injury claim. You have a three (3) year statute of limitation under Missouri law to bring a claim. In a normal personal injury claim, you would have five (5) years to file a claim. Under Missouri Workers’ Compensation laws, a two (2) year statute of limitation exists to file a claim. Depending on the type of claim, a wrongful death claim is brought on behalf of the estate of the decedent. If the decedent dies without a will, an estate must be opened and letters of administration are issued. The administrator of the estate will be the Plaintiff in the wrongful death suit. Dependents can also file an action claiming loss of society and financial loss as a result of the wrongful death. Hiring a lawyer is essential to get adequate compensation in a wrongful death claim. The Law Offices of Patrick S. O’Brien employ four (4) investigators who are experienced in investigating all aspects of the claim to make sure every angle is covered to insure victory. Our office pays all expenses up front to bring a wrongful death case and only charges a fee if we receive compensation for you. If you hire us to represent you at this most stressful time, we will work diligently to advise you, prosecute your claim, and collect the money you deserve for your loss. We are available at any hour to discuss your case and answer any questions you may have. He has consistently received a 5.0 out of 5, the highest possible rating for professional ethics and legal ability awarded by the organization's peer review rating system. Patrick S. O’Brien has been designated an AV® Preeminent™ Peer Review Rated attorney by Martindale-Hubbell annually since 1995. He is also proud to have been selected a “Best Lawyer” in America for Railroad Law in 2013, 2014, 2015, 2016, 2017 and 2018. 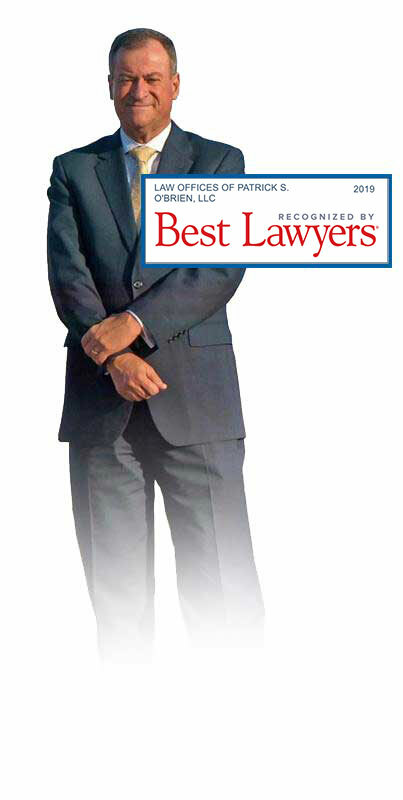 His Law Offices of Patrick S. O’Brien, LLC has been selected as a “Best Law Firm” in America in 2014, 2015, 2016, 2017 and 2018. Patrick is proud to have attained a 10.0 (superb) rating from Avvo.com. © 2019 Law Offices of Patrick S. O'Brien.